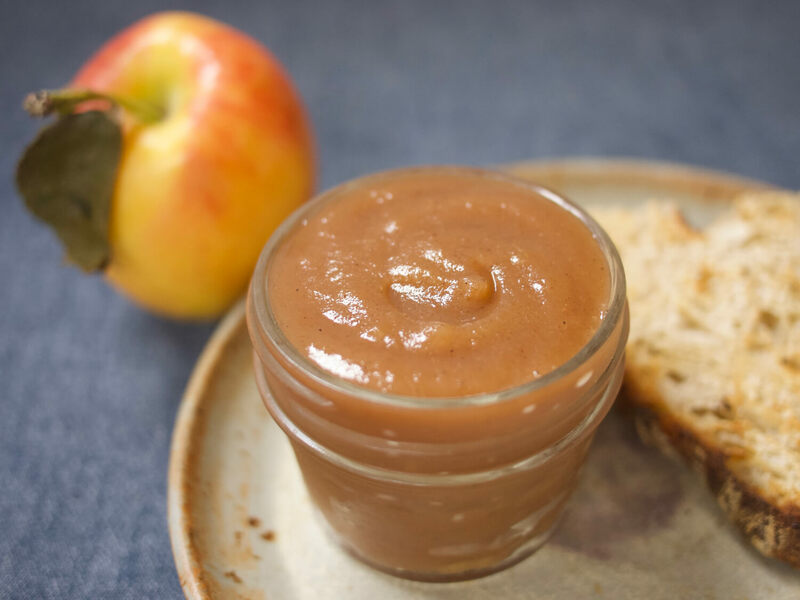 Apple butter is a wonderful thing to keep in the fridge - it's rich, thick, and perfect spread on toast, scones, or anything else that could use a pop of smooth, spiced sweetness. Traditionally, apple butter has been made by cooking apples on low heat on the stove - but once they move past the point of apple sauce, they become more likely to burn as they caramelize. A slow cooker takes the risk and the time spent stirring and watching the pot out of the equation. All it takes is some advance planning. This recipe offers a suggestion for spices that go well with the apples - feel free to adjust it as you see fit. Place all ingredients except for vanilla extract in slow cooker and stir until apples are evenly coated with sugar and spices. Set slow cooker on high and cook, covered and stirring every hour or so, until apples are soft and break apart easily when pressed with the back of a spoon. Using an immersion blender, puree the apples in the slow cooker until smooth. If you don’t have an immersion blender, transfer the apples to a regular blender in batches to blend, being careful as the apples will be hot. Return the cooked apples to the slow cooker if using a regular blender. Cook on low, uncovered, for 2 more hours, or until apple mixture has browned, flavors are concentrated, and the mixture is smooth and buttery rather than loose and watery. Stir in the vanilla extract and turn off slow cooker. Transfer the apple butter to a clean, heat-proof container and allow to cool to room temperature before storing in the fridge. Apple butter will keep for 2 weeks in the fridge and 4-6 months in the freezer. Makes about 4 cups. Adapted from The Kitchn. This recipe is ridiculously simple, but also completely unexpected. A savory pasta dish with cinnamon, parsley, and brown butter? Don’t knock it til you try it.